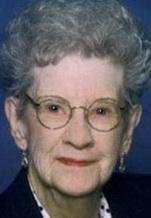 Marian Lucille Bergman, 91, of Cedar Falls, Iowa, died Sunday, March 18, 2007, at her daughter’s home in Springfield, Missouri. She was born July 13, 1915 in Hazelton, Iowa, the daughter of Matthew and Mattie (Kaster) McDowall. Marian attended Hazelton and Aurora public schools. She married Paul Kaiser on September 23, 1933 in McGregor, Iowa, and he preceded her in death in 1978. On November 17, 1984, Marian married Theodore Bergman at Strawberry Point, Iowa, and he preceded her in death on November 21, 2003. She was a member of Orchard Hill Church, Kitchen Klatter Club, and various card clubs and church groups. Marian is survived by one son, Paul (Joy) Kaiser, Jr., of Shell Knob, Missouri; two daughters, Marilyn (Donald) Fredrick of Strawberry Point, Iowa and Marlene (Bud) Brown of Springfield, Missouri; one stepson, Dale (Peggy) Bergman, of Milwaukee, Wisconsin; two step daughters, Dorothy Roiseland of Waverly, Iowa and Laurie Burger of Denver, Colorado; and ten grandchildren, twenty-two great-grandchildren and fifteen great-great-grandchildren. She was preceded in death by her parents and both husbands; one step daughter, Nancy Schoeman; five sisters: Jean Petticord, Jessie Weisert, Lois Hillman, Betty Edwards and Helen Murphy; and five brothers: Gilbert, Ross, Leonard and William McDowall, and Leslie Means. Funeral services will be 10:30 a.m. Thursday, March 22, 2007, at Orchard Hill Church in Cedar Falls, Iowa, with interment at Floral Hills Cemetery in Oelwein, Iowa. Visitation will be 4—7:00 p.m. Wednesday at Dahl-Van Hove-Schoof Funeral Home in Cedar Falls, and one hour before service at the church. A memorial fund will be established.